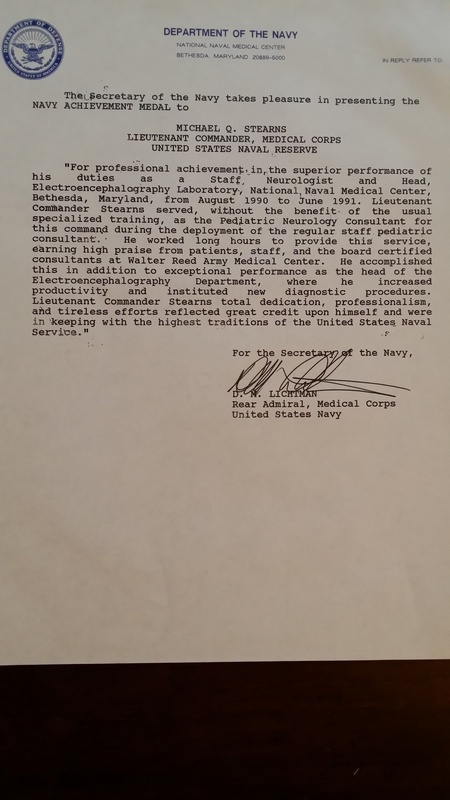 Dr. Michael Stearns was awarded the Navy Achievement Medal for serving as the pediatric neurologist at the National Naval Medical Center in Bethesda, Maryland, during the Desert Storm conflict in Iraq in 1990. Dr. Stearns was serving as an staff neurologist and director of the neurophysiology laboratory at this command. He was asked to cover the pediatric neurology services for the board certified pediatric neurologist. She had been deployed on the U.S.S. Comfort, a hospital ship that was deployed to the Persian Gulf. During a nine month period, Dr. Stearns, in addition to his other responsibilities as an adult neurologist and head of the Electrophysiology Department, cared for inpatients on the pediatric ward, the pediatric ICU, the neonatal intensive care unit, and in the pediatric neurology clinic as the sole provider of pediatric neurology specialty care at the National Naval Medical Center. He was supported by board certified pediatric neurologists via primarily remote communications at the Walter Reed Army Medical Center. For his efforts he was recognized by the Navy and awarded the Navy Achievement Medal. Dr. Stearns was decorated by the Surgeon General of the Navy during an awards ceremony. 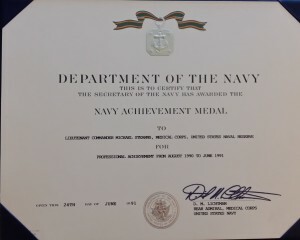 On 19 August 1994, the Secretary of the Navy changed the name of the award to Navy and Marine Corps Achievement Medal. Eligibility Requirements. Awarded to members of the Armed Forces, including members of Reserve components on active or inactive duty, of the grade of lieutenant commander/major and junior thereto, for service performed on or after 1 May 1961. 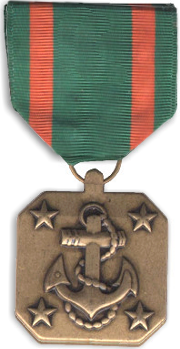 The award shall be given for meritorious service or achievement in a combat or non-combat situation based on sustained performance or specific achievement of a superlative nature, and shall be of such merit as to warrant more tangible recognition than is possible by a fitness report or performance evaluation, but which does not warrant a Navy and Marine Corps Commendation Medal or higher. (b) Be an important contribution of benefit to the United States and the Naval Service.